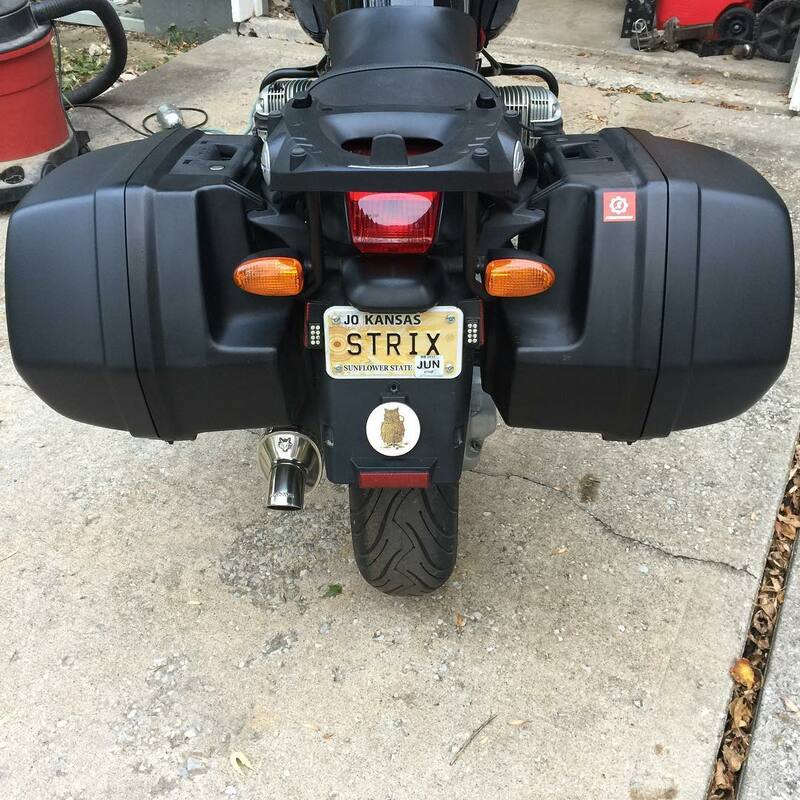 This is a story about me efforting (this is a word that a dear friend used to describe how I tend to become obsessed and spend a great deal of energy in order to achieve an outcome or result) to add more storage space to Strix. This should have been a simple project as my best riding companion had completed the same project years ago. Unfortunately it turned out to be quite quixotic and unnecessarily complex because of BMW part number shenanigans and limited parts counter experience. The project was, however, completed as a direct result of me asking the right person the right question, that right person being knowledgeable and resourceful, and me being stubborn enough to keep trying to make this happen. The rub here is that I didn’t buy the bike to use it as an around town ride – I bought it to make modifications and install my favorite farkles so I can use it as my more modern than Otus touring machine. You’re probably wondering why I didn’t just buy an RT but if you are, see #1 and #2 above. My personal preference and crushing desire to configure the motorcycle the way I want is how I got here. There are some trade-offs associated with selecting a (mostly) naked bike as a touring platform but the idea was to do what I want starting with a basic motorcycle. Would it have been cheaper to get a purpose-built touring machine? Maybe, but I’m not adding up the receipts. The first challenge for me is that the left side system case is very small and, therefore, pretty much useless for carrying anything other than a 3″ x 5″ index card and a #2 pencil. To be fair, this is part of the overall design of this model motorcycle. 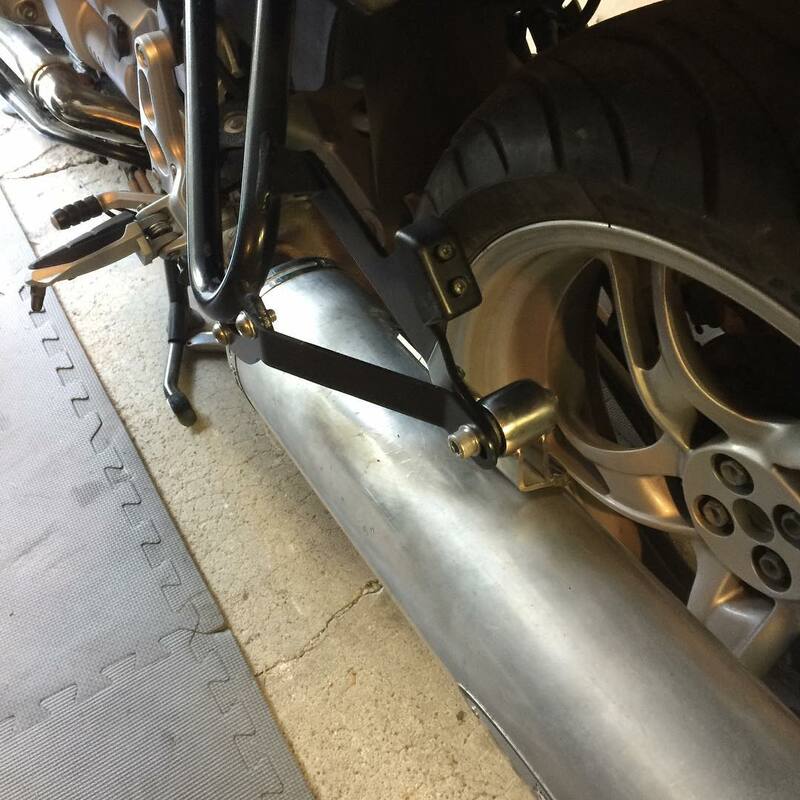 To keep the appearance of the bike “clean” BMW chose to tuck the muffler up and behind the left side case. To pull this off they had to carve out a significant portion of the case to conceal the muffler. This approach does look good but that’s where the goodness stops – for me anyway. After rejecting #1, having no luck with #2, and being unwilling/unable to actually fulfill #3, I decided the right course of action was #4. This, as so many projects I take on, became quickly quixotic. Stating the solution this way was the biggest part of the problem. 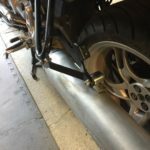 I didn’t just need to lower the exhaust; I needed to lower the exhaust AND provide a way for the full-size system case to be attached to the motorcycle as BMW intended. It’s that second part – attached to the motorcycle as BMW intended – that made this the biggest challenge. There are exhaust lowering kits to be had fairly easily. The Googles helped me find one and UPS had it on my doorstep in just a few days. It was easy to install and did, indeed, lower the muffler so that a full-size system case could fit on the left side of the bike. I was quite proud of myself for “solving” the problem. I was so proud that I proceeded to craigslist, located, and purchased a full-sized system case for Strix’ left side. Victory was as hand! With the exhaust lowered, my craigslist full sized system case hung from the left case holder just as it should but there was a problem; the cap on the rear foot peg plate was designed to fit snugly between two cast tabs on the front of the side case. The tabs on the small fit perfectly on either side of the cap (you know, as designed) but the tabs on the large case were in a completely different position so the tabs did not matter. Now the challenge was on – I had to find a way to relocate the mount to allow the tabs on the case to do their job. There has to be a BMW part to make this happen, right? I mean, my riding buddy had done this so all I have to do is find the correct factory part. My local BMW dealer should be able to do that, right? Well, that’s what I thought anyway. Once upon a time there was a part number for a parts kit that moved the bag mount in to allow a full sized system case to slide in place. I went to my go-to source for tracking down parts – Bob’s BMW Microfiche. The challenge in this situation was that I was looking for a factory part for an “Authority” (read “Police”) R bike and I got nowhere on my own. Because I couldn’t find the right model, and I knew my buddy had done this conversion and got the parts at the local BMW deal, I decided to visit in person and talk to someone at the parts counter. I described the situation to the unnamed parts dude. 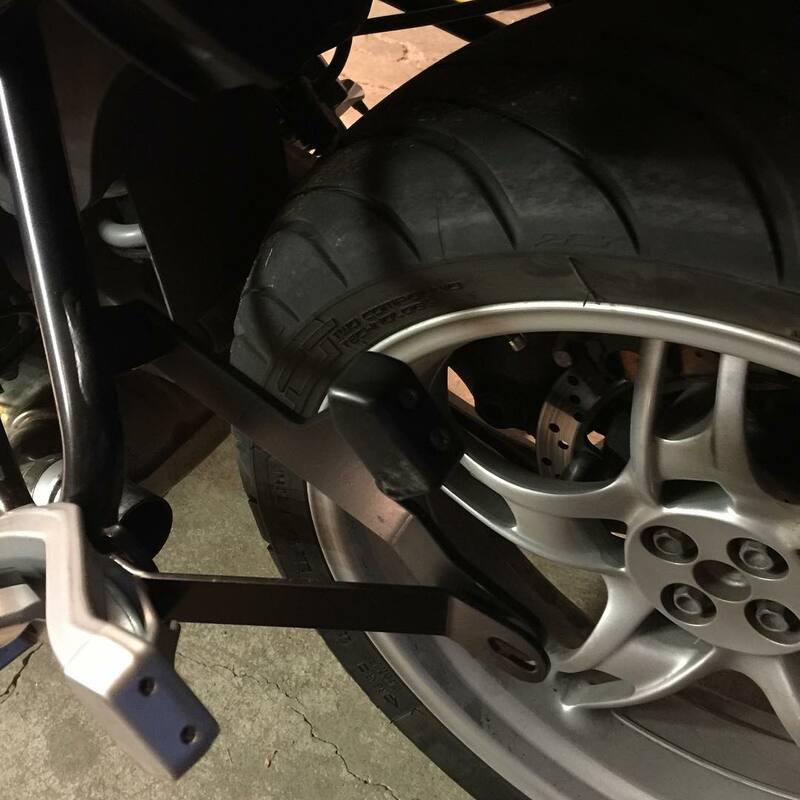 We decided to look through my riding buddy’s parts purchasing history and we eventually found the part and part number for the bracket I needed! A quick trip to the parts system and joy turned almost immediately to despair as I was informed that the part is no longer available. In fact, the original part number had been re-issued to represent a totally different part and we were at a dead end. At this point I was pretty sure the only use I’d have for the big system case would be as a really weird briefcase. Fast-forward several months and I was chasing parts for Otus. I placed an order with Bob’s and the Bob’s emailed me to let me know some things were out of stock/no longer available but there were other dealers with the part still in stock according to BMW’s central parts brain. Because I still had that big bag sitting in the garage, and because Bob’s parts team contacted me, I took a chance and started a chat with the parts team to tell my big bag tale of woe. A quick re-telling of the tale and giving the Bob’s parts guy the original part number let to a “BRB” response. Right back was right and a new parts number along with the location of said part was provided. Yes, that’s right; BMW had issued a new part number for the part I was seeking and one was covered in dust at a BMW dealer. I was given the new part number, the dealer’s name, and the dealer’s phone number. Here’s the best, and most ironic part of the story; the part I was seeking was sitting in inventory at my local BMW dealer. Yes, the same dealer where I spent an hour at the parts counter pursuing this part. I called, read off the part number to the local parts dude who answered the call, and asked if he could verify that he had the part. He said he had it. I asked him to put my name on it and told him I would be right down to get it. I went straight to the dealer, straight to the parts counter, and gladly paid to take ownership of this rare and elusive part. I started this quest because I rejected the idea of taking less crap and, now that I have a full-sized bag on both sides of Strix, I should be happy, right? 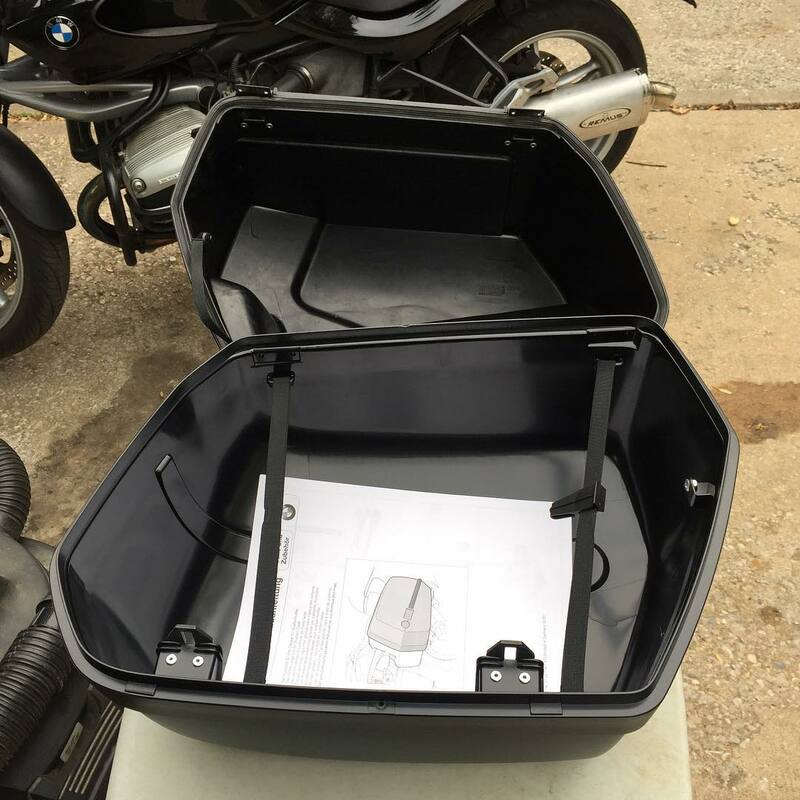 Well, there are these items on the Bob’s BMW website called BMW System Case Deep Lids. Adding these lids add six liters of additional capacity to my system cases. If I add two of them I can carry an additional 12 liters of stuff! Remember – rejecting the notion of taking less crap is how I ended up chasing the full-size left bag in the first place, so why stop now? Besides, this looks really simple – the only tool I really need to make this happen is my credit card, so why not, right? Why not indeed. adding these deep lids is, frankly, cool and hilarious all at once. The pictures tell this story better than my words. One thing I will add – I even further modded this mod. To swap the system case lids, I had to drill out the pop rivets that held the factory lids in place. Included with the deep lids is a set of machine screws, lock nuts, and washers – all quite suitable for attaching the new case lids. This hardware was, however, zinc-plated which means it will eventually rust. To “do it right” (which, in my world means “to make things even harder”) I went to the local hardware store and bought stainless steel machine screws, lock nuts, and washers to use instead. It’s this kind of behavior that makes things take longer in my world. I hope you enjoyed this story as much as I did living it and then re-telling it. This mod should not have been such a challenge but my friends at BMW raised the degree of difficulty by switching around part numbers. But then I suspect the fact that BMW made it harder is why I am a BMW rider; if it were easy I wouldn’t be all that interested in their motorcycles in the first place.